A number of Ford F-150 Raptor fans have been crying out for a V-8. Hennessey Performance Engineering has heard those cries because the Texan tuner has built a Raptor housing eight cylinders under the hood. From the factory, there's only one engine choice available for Ford's latest Raptor. It's a 3.5-liter twin-turbocharged V-6, and it suits the truck just fine. There's usually no complaining when dealing with a 450-horsepower pickup truck, but a V-8 makes tremendous noise and that's part of the reason why Raptor lovers want such an engine in this type of truck. 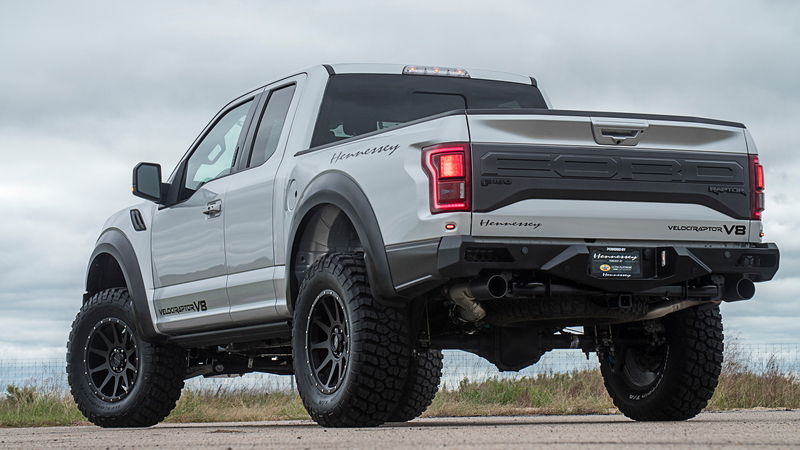 Other companies have taken V-8-powered F-150s and applied the Raptor running gear underneath, but Hennessey has decided to start with a Raptor and swap in the larger motor. Using a 2019 Raptor as its starting point, Hennessey swaps in Ford's 5.0-liter V-8 and bolts it to the Raptor's 10-speed automatic. Hennessey also needs to swap over the wiring harness, computers, and other electronic bits from the V-8 to make it all work smoothly. Because this is Hennessey we're talking about, the engine isn't left stock. A 2.9-liter supercharger has been added and runs a mild 7 psi of boost. That's enough to produce 758 hp. 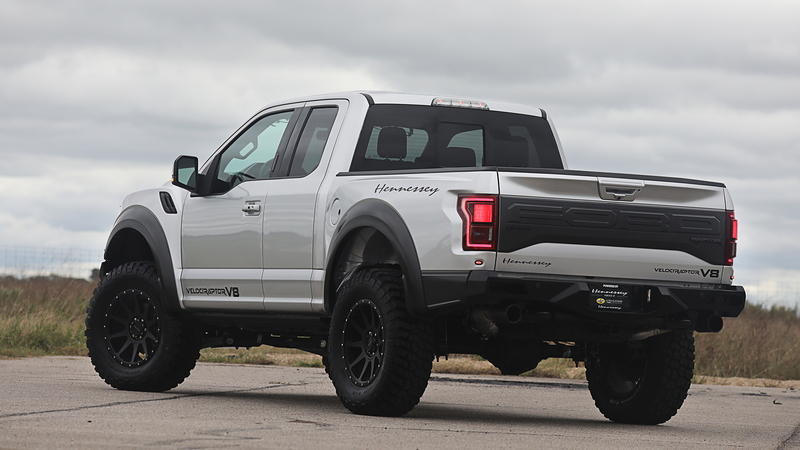 With its new powerplant in place, this Hennessey Raptor, rebranded with the tuner's VelociRaptor moniker, is capable of running from 0-60 mph in just 4.1 seconds. That's close to a second quicker compared to the stock version of the truck, which is already a quick machine considering its inherent heft due to all of that off-road running gear. Hennessey doesn't stop with the engine. 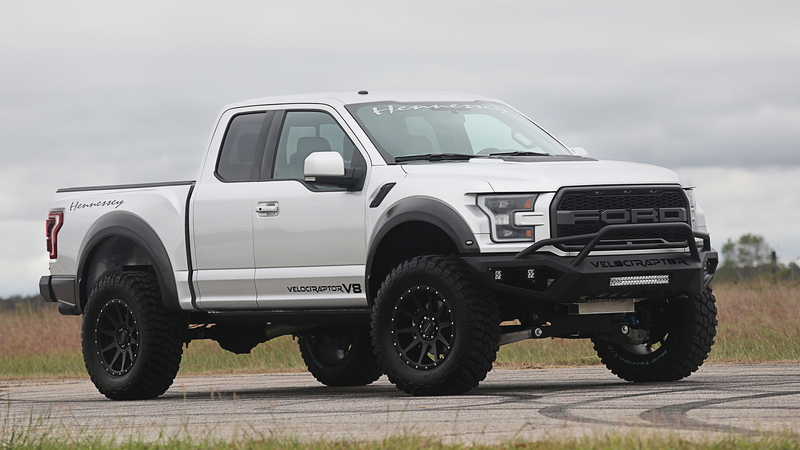 The VelociRaptor wears new front and rear fascias, a plethora of LED auxiliary lights, upgraded suspension bits, 20-inch Hennessey alloy wheels, and 37-inch BFGoodrich KM03 tires. 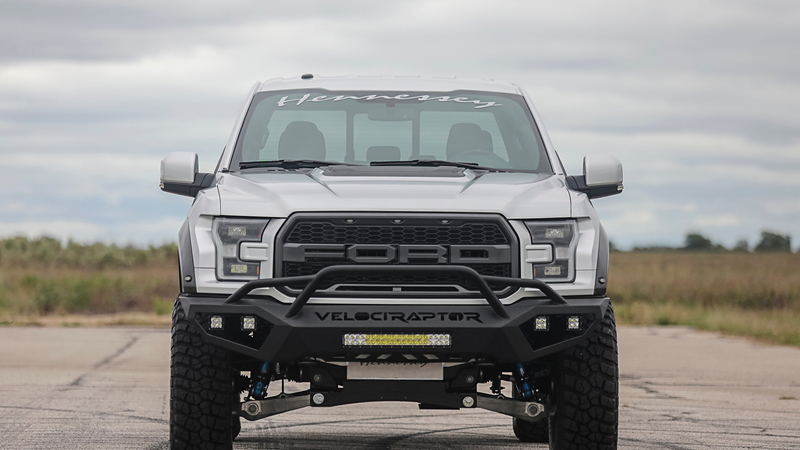 The Hennessey VelociRaptor costs $147,950. That includes a 2019 Ford Raptor, so the price, while steep, is not utterly insane. Hennessey plans to build just 100 units for 2019 and each example will carry a three-year/36,000-mile warranty. No word yet if Hennessey will also offer the V-8 Raptor with a 6x6 option. For those calling for a V-8-powered Raptor, the truck has arrived. Now it's time to round up the cash to go get it.